Thank you for all your comments Nia, you’re too kind! Robert you sure do know how to take something that I would never think to consider shooting and make it very interesting. 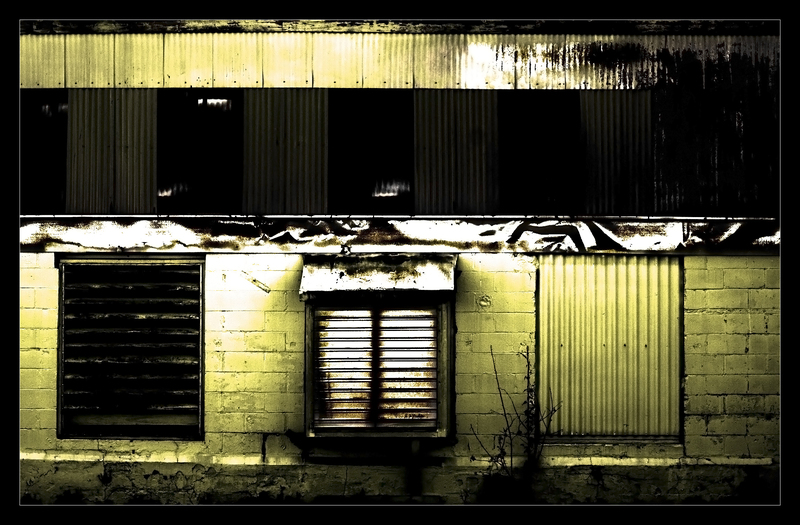 Is this the outside of a defunct factory or store? Is the light coming from a streetlight or did you use a flash? Well done again!!! Thanks MDP! It’s a bad habit. I tend to go through phases – I’ll spend a week wandering around ‘exploring’ trying to find locations like this one. The nice thing is you’ll never run out of content though! I’m not quite sure if it was totally abandoned, certain areas were still lit, but it’s definitely beat the hell up and it was pretty desolate there. The light is a combination of streetlights (Angeline had it correct two posts down) and the lighting under the awning. It was shot behind glass which picked up the street lights (upper center and left). I made the yellowish hue ‘pop’ a bit more, and as Ken below mentioned, upped the contrast to really get some of the texture and rust to come through. Great composition and high contrast lighting, yet a little mysterious. Wonderful shot! I have the same questions as mdphotographers…is that a reflection in the black area? Or is it a panel that we’re looking through to lights in the distance? Fascinating. aih…. you have a great vintage color, amazing! Thank you Ciluuk! Your photos are amazing! I like the work you did on the color of this photo. Great use of light as well!